What is the Definitive Musical for Each Decade? Since we're now halfway through our current decade and have already seen some incredible work, taking into consideration music style, plot, characters, themes, what musicals do you think define each of the previous decades? Keep in mind, we're not talking about the "best work" or the show that won the most awards. We're talking about decade defining musicals. Here are our picks. Let's start with the 1920's. This shouldn't a surprise considering it's one of the most important pieces in musical theatre history. Mostly because it set a course for what we know as the modern musical. Andrew Lamb wrote how it, "represented an even more complete integration of book and score than the Princess Theatre musicals, with dramatic themes told through the music, dialogue, setting and movement. This was accomplished by combining the lyricism of Kern's music with the skillful libretto of Oscar Hammerstein II. One historian wrote, "Here we come to a completely new genre – the musical play as distinguished from musical comedy. Now ... everything else was subservient to that play. Now ... came complete integration of song, humor and production numbers into a single and inextricable artistic entity." Containing the very best of Cole Porter's music, this piece includes such 30's classics as "You're the Top", and "I Get a Kick Out of You" and of course "Anything Goes". Interestingly enough, the original idea for a musical set on board an ocean liner came from producer Vinton Freedley, who was living on a boat, having left the US to avoid his creditors. He selected the writing team, P. G. Wodehouse and Guy Bolton, and the star, Ethel Merman. The first draft of the show was called Crazy Week, which became Hard to Get, and finally Anything Goes. The original plot involved a bomb threat, a shipwreck, and hi-jinks on a desert island, but, just a few weeks before the show was due to open, a fire on board the passenger ship SS Morro Castle caused the deaths of 138 passengers and crew members. Due to the incident, the creative team changed the plot. When it opened in 1934, It ran for 420 performances, becoming the fourth longest-running musical of the 1930s, despite the impact of the Great Depression but since then has become the age defining musical of the era. By the 1940's came around and the came with it, the end of the Great Depression, there was a change in the way musical theatre was presented. Oklahoma! did this by tightly integrating all the aspects of musical theatre, with a cohesive plot, songs that furthered the action of the story, and featured dream ballets and other dances that advanced the plot and developed the characters, rather than using dance as an excuse to parade scantily clad women across the stage. “After a verse like that, sung to a buoyant melody, the banalities of the old musical stage became intolerable. "It was the first "blockbuster" Broadway show, running a total of 2,212 performances, and was made into a hit film. It remains one of the most frequently produced of the team's projects. William A. Everett and Paul R. Laird wrote that this was a "show, that, like Show Boat, became a milestone, so that later historians writing about important moments in twentieth-century theatre would begin to identify eras according to their relationship to Oklahoma!" Despite being one of the best all around musicals of all time, it was one of the first pieces to use colloquialisms within its text. Although it eventually became the fifth longest-running Broadway musical of the Fifties, it was a long and difficult road getting it to the stage at all. Producers Cy Feuer and Ernest Martin originally envisioned the musical as a serious romantic story along the lines of South Pacific. After hiring composer and lyricist Frank Loesser, they eventually went through 11 librettists before finally deciding to make the project a comedy and settling on Jo Swerling and Abe Burrows, a radio and television writer with no theatrical experience. Probably going to hear it over this choice but hear us out on this one. The issue with making a selection for this decade is that you have a clear polarization of culture from the early 60's to the late 60's. If we were to separate the difference, the early would probably be best represented by How to Succeed... and the late obviously being Hair. So what's the imperfect solution? That would be Sweet Charity. A musical that begins with the hope and optimism of the era ends with the preparation of the cynicism of the 1970's. Add Fosse's choreography and Cy Coleman's lounge style score and it doesn't get much more 60's than this. Another debatable choice but if you really sit down and think about it, the choice becomes more obvious. While Company dealt with more adult themes and Pippin dealt with a discovery of self worth, A Chorus Line took the audience backstage into the performers mindset. The musical was formed from several taped workshop sessions with Broadway dancers, known as "gypsies," including eight who eventually appeared in the original cast. The sessions were originally hosted by dancers Michon Peacock and Tony Stevens. The first taped session occurred at the Nickolaus Exercise Center January 26, 1974. They hoped that they would form a professional dance company to make workshops for Broadway dancers. "Michael Bennett created a style of choreography that remained unique to each particular show. At the top of his form with A Chorus Line, he incorporated what he called "cinematic staging." There was constant "jump-cutting" as the audience's attention was shifted from one figure to another. Bennett brought things into sudden focus as in a film through stage dissolves, close-ups, montages and wipes. Equally effective, creative and dramatic was Bennett's use of mirrors in the show. It was musical staging that went beyond anything other musicals had ever presented." The 1980s saw the influence of European "mega-musicals", or "pop operas", on Broadway, in the West End and elsewhere. While you could certainly argue in favor of Les MIserables since it basically kicked off the mega-musical age, but Phantom took it to entirely different level. The lush score featured uninspired, babbling lyrics set to lush pop-operetta melodies, and an ending that departed completely from Gaston Leroux's classic novel. Phantom is a classic example of form over function which perfectly defines the 1980's. 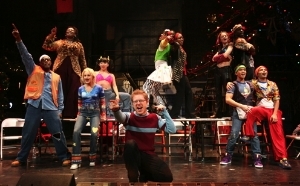 "Rent is so many things to so many people. It was the first musical in decades that younger audiences really identified with, that speaks in their voice, that voices their concerns, that tackles their issues. It breathed new commercial life into the Broadway musical, possibly signaling the beginning of the end of the great divide between pop music and theatre music, which has existed since the advent of rock and roll in the 1950s." In large part, the early 2000's would be defined as a Post 9/11 mentality. And while this country was at war and paranoia was at a ll time high, Wicked took one of this country's most cherished stories and spun it into a tale of judging others based on their appearance. WICKED qualifies as the most significant musical of the decade,primarily because of its status as a global brand (worldwide grosses: $1.7 billion and counting). But it too has a traditional book and employs an original score of songs to tell a story with broad appeal and just a little moral guidance. The major musicals of Rodgers and Hammerstein — “Oklahoma!,” “Carousel,” “South Pacific” and “The King and I” — never stooped to sermonizing, but behind them is a moral vision of how humans can and should interact, a strong sense of the power of love as a force for good. “Wicked,” along with “The Light in the Piazza,” represents the continuing vitality of the classic musical formula. only American show to achieve mega-hit status in the last decade. So what will the definitive musical for the 2010's? Fun Home? The Book of Mormon? Is it already Hamilton? Time will tell.